The Intel® Itanium® architecture is a unique combination of innovative features such as explicit parallelism, predication, speculation and more. The architecture is designed to be highly scalable to fill the ever increasing performance requirements of various server and workstation market segments. The Itanium architecture features a ...revolutionary 64-bit instruction set architecture (ISA), which applies a new processor architecture technology called EPIC, or Explicitly Parallel Instruction Computing. A key feature of the Itanium architecture is IA-32 instruction set compatibility. The Intel® Itanium® Architecture Software Developer’s Manual provides a comprehensive description of the programming environment, resources, and instruction set visible to both the application and system programmer. In addition, it also describes how programmers can take advantage of the features of the Itanium architecture to help them optimize code. This volume defines the Itanium application architecture, including application level resources, programming environment, and the IA-32 application interface. This volume also describes optimization techniques used to generate high performance software. This volume defines the Itanium system architecture, including system level resources and programming state, interrupt model, and processor firmware interface. This volume also provides a useful system programmer's guide for writing high performance system software. This volume is a comprehensive reference to the Itanium instruction set, including instruction format/encoding. 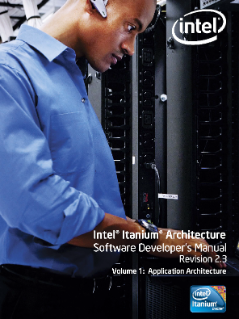 Read the full Intel® Itanium® Architecture Software Developer's Manual.